The US Army Corps of Engineers (USACOE) Chief’s Report includes some significant mitigation measures to be implemented at the outset of the project. 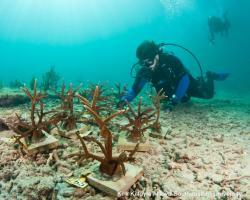 A key innovation of the project includes transplanting approximately 103,000 nursery-propagated corals over existing reef areas and new artificial reefs, along with the relocation of existing corals that may be affected within the footprint of the project. 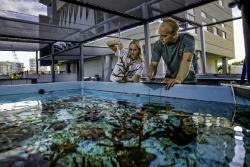 PHOTOS: Our neighbor, Nova Southeastern University is already having great success with nursery-raised corals at their Ocean Campus of the Halmos College of Natural Sciences and Oceanography.